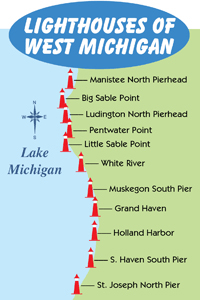 You've seen it in numerous photographs, and it is now ranked #1 lighthouse to visit in Michigan...plus The Weather Channel voted it one of the top 10 lighthouses to see in the United States! 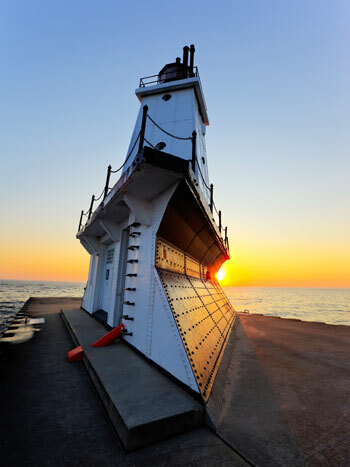 The North Breakwater Light is Ludington's focal point, and a great place to watch the sunset or wave at the S.S. Badger carferry as it cruises out onto Lake Michigan. The breakwall leading out to the light is a popular venue for fishermen and those who enjoy walking the mile-long round trip. 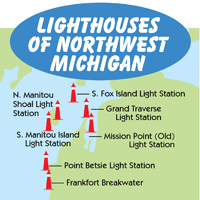 Lighthouse tour hours are available May 24-September 2, 2019. 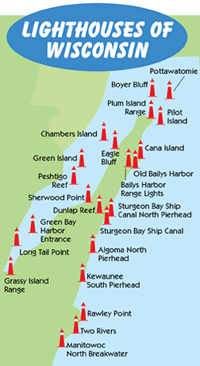 The Sable Points Lighthouse Keepers Association maintains the North Breakwater Light, and it is open to the public for tours daily from 10am-5pm. There are 53 steps to climb to the top. There is a $5 donation fee for adults, $2 for children 12 & under. Due to weather conditions and staffing, it may be wise to call ahead at (231) 845-7417, or visit www.splka.org for more information. 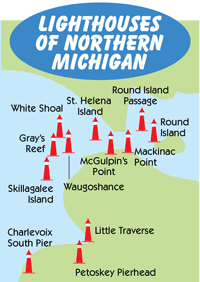 The white, pyramid shaped tower that is known as the Ludington North Breakwater Light (not an official lighthouse, since a house has never been attached to it) has a history that's as fascinating as its structure. 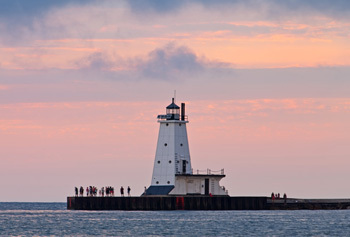 With $6,000 from Congress, the first Ludington light was constructed on the outer end of the south pier, and lit in 1871. Standing only 25 feet, the upper section housed a service room, which the light keeper could use during inclement weather. Money was no problem when it came to constructing Lake Michigan pierhead lighthouses, but Congress frequently dragged its feet in appropriating funds for the construction of keeper's dwellings. Edwin Slyfield, light keeper in 1891, encountered dangerous conditions when he had to navigate the pier during November gales in order to service the light. It wasn't until 1900 that a keeper's quarters was finally constructed, and Mr. Slyfield and his family finally had a home. The Army Corps of Engineers recommended in 1906 that a pair of timber breakwaters be constructed in an arrowhead formation to protect the entrance to the harbor. Work was completed on this project in 1914, and it became clear that the present light was not adequate for the number of carferries entering the harbor. Five years later, the timber breakwaters began to decay, and concrete structures were approved as a replacement. In 1923, it was decided that a new light should be built at the end of the North Breakwater, rather than the south side. So in 1924, the present tower began to take shape, fabricated of steel plates over a steel skeleton. This four-sided, white pyramidal tower was built with four porthole windows on each of the three decks. The unusual shape was designed to deflect the strong waves of Lake Michigan. A fourth-order Fresnel lens, manufactured in the United States rather than France, was installed in the new station's lantern. The North Breakwater Light was automated in 1972, and the Fresnel lens (now on display at Historic White Pine Village) was replaced in 1995 by a Tidelands Signal 300 mm acrylic optic. In 1994, the crib on which the light sits settled, and the tower tilted four degrees to the northeast. Cost to repair it was considered excessive, so the Army Corps of Engineers decided it was safe and to leave it as is. Looking at the North Breakwater Lighthouse today, the tilt can still be seen. Follow US-10 west as it turns into Ludington Avenue, turn right onto M-116, go four blocks, then turn left into Stearns Park. Go to the end of the park, then walk the breakwall out to the lighthouse.